I skipped Giverny today -- Monet's Garden. Amanda, Heidi and Stephen got up at 5ish (I went to bed at 4:15a!) and I decided I had too much work to do and I've already been there and I didn't want to spend a whole day at one house looking at flowers.... even if it is Monet's house and the flowers are important. Maybe another day. 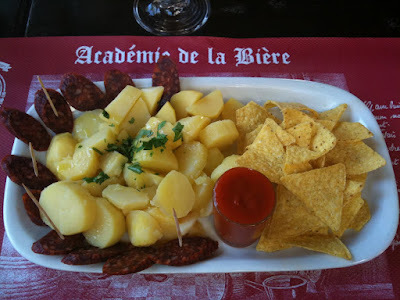 Got up late and went to Beer Academy for a light lunch: Aperitivos and Beer. 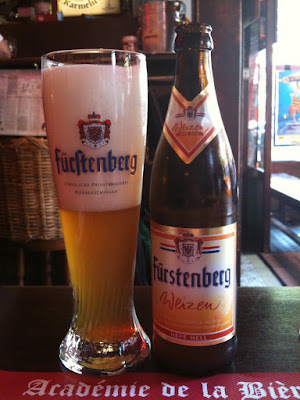 I've had most of the beers on tap now and the bottles are normally only 33cl and I wanted 50cl so he recommended a german beer: Fustenberg, which comes in 50cl. One of the things I like about beer is it is such a beautiful drink. I love watching the chemical-like reaction in a nice tall glass. You have the head (I like to pour it fast!) which takes up most of the glass and then gradually you watch the carbonation at the bottom of the glass work its way up and the beer starts to clear at the bottom while still churning in the middle as the foam begins to shrink. It just looks like a magical potion. PS By the way, Julia wasn't there today. I had mentioned to the server that they seemed unusually busy today. He replied there were only two people working. I asked where Julia was. He said she had a rather late night and was in no condition to report to work. I have heard of calling in sick before, but calling in drunk? Julia, you have so much to tell me about tomorrow! By the way, in her defense, Wednesday and Thursday are her "weekend" and she was only supposed to come in today to cover for another person.